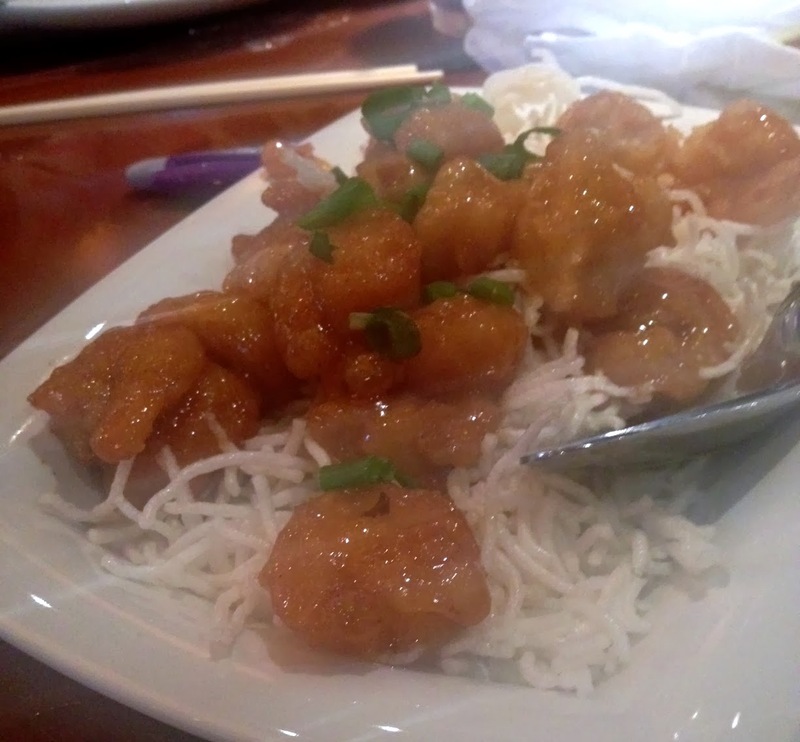 Restaurant: PF Changs Fall Menu | The Food Hussy! I had the opportunity to host a surprise baby shower for a good friend recently. It was so much fun! This is actually her 3rd baby - but I found out from her hubby that she'd never had a baby shower! (WTH?) So I knew - I had to throw one for her! We planned and schemed behind her back - got her friends all set up and then I told her I wanted to take her out to lunch at PF Changs (one of her favorites) before the new baby boy came to visit! It was all set! Our other friend Jen even brought her new buddy to the party! It was really great to get to cuddle and snuggle him for a couple of hours too! Then Leah arrived and was so surprised that she even teared up a bit! It was great! We only did one baby shower game (much to the delight of the guests) and had a great time! But while we were there...we had to eat too! Leah got the Crisp Honey Shrimp and she let me snag a bite - it was good! I love shrimp and like the crisp coating with the honey glaze. I love that they have seasonal menus - so I always try and grab from that. The fall menu had something I could not resist: Vietnamese Noodles with Steak & Shrimp! They describe it as a pho-inspired dish with hoisin, sriracha, cinnamon & coriander along with flank steak, shrimp and lots of veggies. I LOVED this dish. 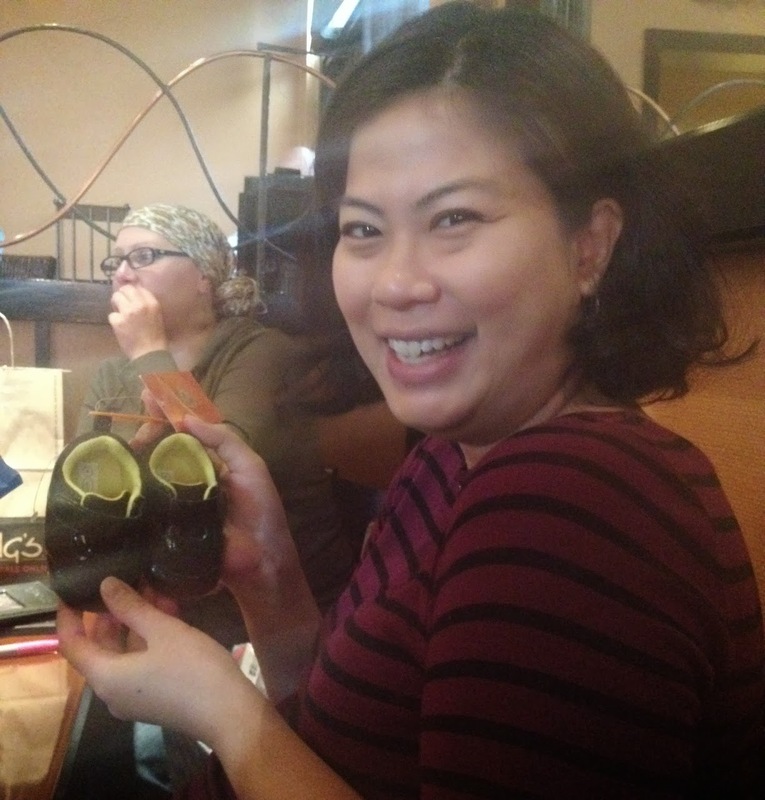 I had previously had the Oolong Chilean Sea Bass (which is to-die-for!!) and I think that dish is great for dinner but this noodle dish was perfect for lunch. It's more casual dining with all the noodles. It was so delicious - I ate every single bite! I definitely have my go-to dishes now for PF Changs! The combination of flavors made every bite so good. And since Leah was the guest of honor - of course she got dessert! She went for a big ol' hunk of cheesecake. It was really big so she had a little help from her friends. They also had mini-desserts for just $2.95 so I tried their blueberry cheesecake - it was just the right size a restaurant dessert. I liked it but I think it was still a little frozen in parts - so kind of icy. I really love PF Changs - they have such a wide variety and so many unique offerings! Plus they were wonderful for our baby shower - they set us up with a table off to the side - with extra room for gifts and the service was fantastic. If you're a fan - they have a special right now that if you buy $100 in gift cards - you get a $20 bonus card! So get a few and give them away or keep them all for yourself and have lunch for free with the bonus card! Disclosure: PF Changs provided me a gift card for this meal but the opinions are all my own.